When offered the chance to review Dracula : The Bloody Truth I have to say I was wary to start with, not being a horror fan I was wondering if I was going to enjoy it. 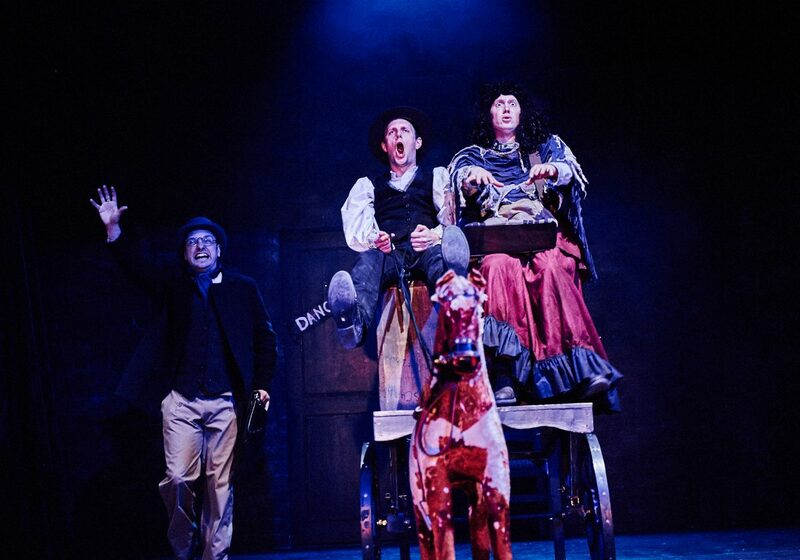 It was with great relief when I saw that Le Navet Bete is a physical comedy theatre company. The touring company consists of just four performers playing all the roles plus one on tech and an ASM and their close relationship of working together and knowing each other for many years certainly shows on stage. 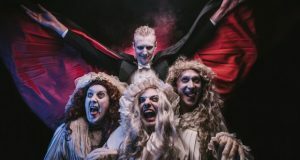 Dracula: The Bloody Truth, whist having a serious sounding title, very quickly proved to be a comedy crammed piece of farcical physical theatre which had me laughing more than any piece of live theatre has done in a very long time. Full of mad costumes, character changes and some deliberately botched scene changes, the sound of enjoyment came from around the theatre fast and frequently. I would love to talk you all through the show fully but doing that would ruin the comedy of it for anybody thinking of going to watch it (and please do). There were some visual and vocal gags older than me in the show but that didn’t stop them being funny when the tools are used correctly. There was a constant acknowledgement of the audience either in facial reaction or vocal responses and a couple of pieces of audience participation. The set which looked dated and serious on entry to the auditorium soon proved to be very cleverly constructed and added to the humour of the show where it was designed to do so. Even the reset in the interval was done by the cast (as expected in a small company) but still fully in character whilst happy to react openly and respond to remarks from the audience. Did everything in the show go as it should have done? Who knows and who cares, the script is so well written and performed that if anything did go wrong it was made into the show as if it was meant to be there. (During a quick Q&A afterwards they even admitted this has happened in the past and created bits that were then added to the show). 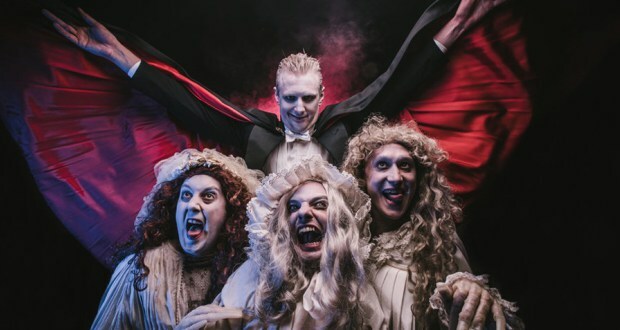 As a big fan of musical theatre I rarely visit the theatre for other genres but today I am glad I did, Dracula: The Bloody Truth was one of my most enjoyable evenings of 2018 . For more information visit Le Navet Bete’s website. 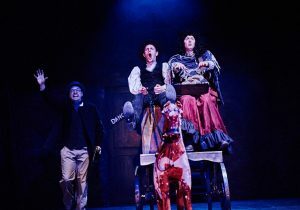 If you like this review you might also like the review for Jekyll & Hyde at the Orchard Theatre, The Full Monty and Little by Little.